Black-Ram Recycling Ltd is fully licensed by the Environment Agency. (EA WML 101421). Our tyre bales are the epitome of a of a ‘sustainable’ product. Our product can be used to replace natural aggregate, which leads to less quarrying and less disturbance to the natural environment. Haulage is three times more efficient as the tyre bales are lighter are lighter than the equivalent volumes of aggregate.. The UK produces 50 million waste tyres annually. Disposing of these tyres ia an ongoing problem, 40% are burnt in cement kilns. 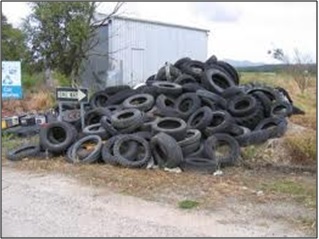 With only a few kilns nationwide accepting predominantly shredded tyres there is a huge energy wastage. The process also poses emission concerns. Black-Ram Ltd is a regionally operated company and we believe in regional responsibility for waste. 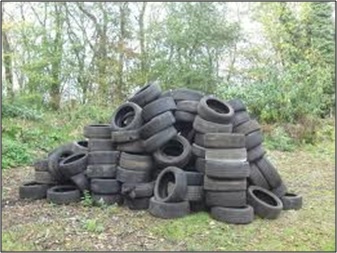 We believe tyres should be recycled and re-used within the same locality.